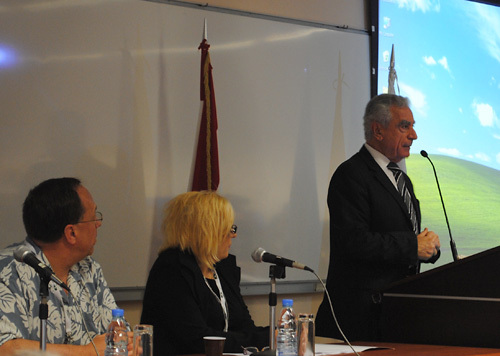 This year’s annual AMICAL meeting and conference, held at LAU, focuses on e-content. Keynote speaker Gene Spencer and Director of LAU Beirut's Riyad Nassar Library Cendrella Habre look on as LAU President Dr. Joseph G. Jabbra welcomes AMICAL annual meeting participants during the opening ceremony. One of a number of roundtable discussions held during the eighth annual AMICAL meeting and conference. 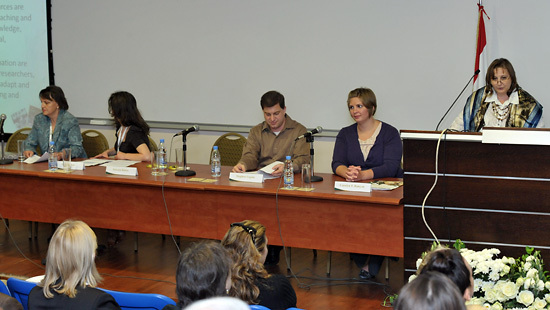 A panel discussion held during the event. Library suppliers and publishers display their products at the entrance of LAU Beirut's Business Building. AMICAL conference participants check out a vendor station in the Business Building. 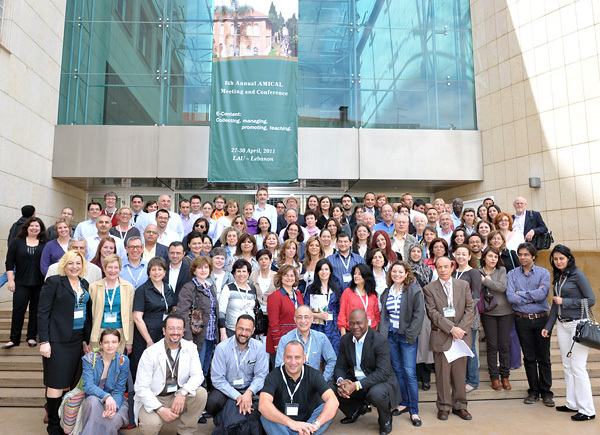 Participants of the eighth annual AMICAL meeting and conference on LAU's Beirut campus. Click on any photo above to view all six images. University libraries around the world are faced with ever-changing internal and external demands, from meeting student and faculty expectations to incorporating the newest technologies in academic content delivery. Professionals from library and IT departments from universities across the world discussed the best ways to meet these demands, as well as encourage interdepartmental cooperation, at the eighth annual meeting and conference of the American International Consortium of Academic Libraries, held at LAU from April 27-30. AMICAL is an international consortium of American-model, liberal arts institutions of higher learning based throughout Europe, North Africa, Central Asia and the Middle East. Members meet annually to discuss emerging issues in the field of higher education with a library and IT focus, according to Cendrella Habre, director of LAU Beirut’s Riyad Nassar Library. Under this year’s theme “E-content: Collecting, Managing, Promoting, Teaching,” members and invited guests explored potential ways for library and information services to transform the way they bring scholarly content to their respective academic communities. “In simple terms, I would say the theme means providing easy access to any piece of information available electronically to end users (in our case, students, faculty and staff),” Habre explains. “E-content has recently invaded our world without prior warning, and we, as libraries, have had to face this challenge through trial and error to meet our end users’ needs,” Habre said during the opening ceremony at LAU Beirut’s Business Building. In his opening speech, LAU President Dr. Joseph G. Jabbra praised AMICAL for its outstanding commitment to delivering academic content innovatively. “We, as presidents and provosts of universities, are very grateful to you, for any institution wouldn’t be worth a grain of salt without a vibrant library at its heart,” Jabbra told conference participants. “There is no way that we can flee this trend. Several of our print journals have been switched to e-format, as well as the majority of our print reference material (dictionaries, encyclopedias, maps, etc. ), and packages of e-books, have been added to our collection,” she explains. Around 135 people, including LAU staff, attended this year’s four-day meeting, which included panel discussions, rounds of lightning talks (highly focused five- to 10-minute presentations), and roundtable discussions. Participants also had the chance to take part in a joint program with the Association of American International Colleges and Universities conference, held at LAU Beirut from April 29-May 1. The AMICAL and AAICU conferences were scheduled concurrently to allow library and IT staff to further interact with the presidents and administrators of institutions. One of the several joint AMICAL-AAICU events included a workshop on IT-library cooperation. This was the second time AMICAL met at LAU (the first was in 2005). Participants hailed from universities including Al Akhawayn University in Ifrane, Morocco; American College of Greece; American University of Paris; American University in Cairo; American University of Beirut; and Haigazian University, to name a few. The conference also gathered representatives from library suppliers and publishers such as EBSCO, Oxford University Press, Thomson Reuters, and Baker & Taylor, as well as some IT companies including IBM Middle East and Hewlett-Packard.